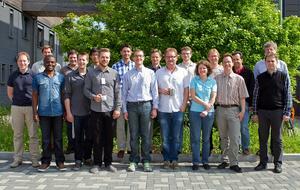 The kick-off meeting of the Pulse Length Measurement Expert Group took place at DESY Hamburg, from the 10-11 June 2013. This group was established by the Collaboration of European FEL and SPS Facilities to foster joint research activities. This initial meeting gave an opportunity to participants to learn about on-going activities and interests of the various facilities on pulse length measurement from which common topics of interest for joint research activities will be identified and work plans developed. Over 20 participants including representatives from Elettra, European XFEL, PSI, SOLEIL and DESY attended the meeting. Stefan Düsterer from DESY is the coordinator of this Expert Group.